Are you considering getting your teeth straightened? Or perhaps you’re looking into the options for your teenager? Clear braces are a popular choice because they are far less noticeable than traditional metal braces. What’s the difference between clear and traditional braces? What about clear aligners like Invisalign? Which different brands are available in the UK? How much are clear braces in the UK? What are the pros and cons of clear and invisible braces? 1.1 Who can wear these braces? 1.2 How do clear aligners work? 1.3 How do traditional clear fixed braces work? 3 How much do clear braces cost? Let’s begin by clarifying what we’re talking about here. 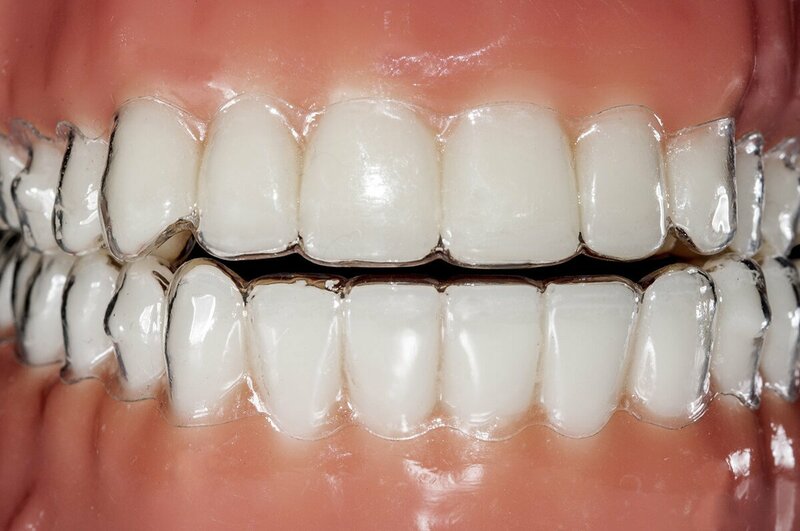 ‘Clear braces’ are like conventional metal braces but with clear brackets (and sometimes tooth-coloured wires). Many people also include clear (or ‘invisible’) aligner braces in this category, since they also are made from clear material. Both types of brace do an effective job of straightening misaligned teeth in an inconspicuous way. The differences occur in the way they work, how they look, what it’s like to wear them and how much they cost. We will look at some of the most popular brands of clear brace in the UK, including Damon Clear and Clearsmile, so you can understand the differences between each one. We have also included information about clear invisible braces like Invisalign so you can easily compare the two options. Teeth straightening with braces is often most effective in the teenage years when the teeth and jaw are still developing. This doesn’t mean you can’t wear braces later in life; in fact, many adults also undergo orthodontic treatment with great results. Thanks to the development of technology used in invisible aligners, you might not even realise that the person you’re speaking to is wearing braces. One thing that may limit your choice of braces is the severity of your case. For example, Invisalign braces can treat 90% of orthodontic cases but in the other 10% where teeth very are badly misaligned, braces which use a wire and bracket system might be the only option. Fortunately there’s an easy way to check whether you’re a suitable candidate for Invisalign treatment. Take a free Smile Assessment in under two minutes to find out if Invisalign is an option for you. Tooth-coloured ceramic braces are another option for people who want a subtle way to straighten their teeth. The choice between clear and tooth-coloured braces may come down to the natural colour of your teeth. People with naturally bright, light teeth usually find that transparent braces are the least noticeable option. For people with darker tooth shades, the tooth-coloured ceramic material can be a more natural match. Apart from this, these two types of brace function in the same way. Transparent aligner systems are a completely different solution for straightening teeth. They consist of a series of clear plastic aligners (or ‘trays’) which fit snugly over the teeth. Trays are custom made for each patient from dental scans or impressions. Every two weeks or so the patient must switch to a new aligner, and bit by bit they shift the teeth to the desired position. Treatment with invisible braces typically takes between 9 and 18 months. One big benefit of these braces is they can be removed – although only for 2-4 hours per day. This allows the wearer to eat what they like and clean their teeth as normal. They are also far less noticeable than any kind of fixed braces – even those with clear brackets – so are the perfect solution for people who want to straighten their teeth discreetly. Brace wearers may want to remove their aligners for important meetings or special occasions and Invisalign offers the flexibility to do this. Aligners can present some inconveniences, though. If you have invisible braces you should clean your teeth after eating or drinking anything other than water, otherwise bacteria gets trapped inside the aligners and increases your chance of dental caries and gum disease. They also require the wearer to have some willpower – if you lack this, fixed braces may be the better choice! To find out more about Invisalign braces and other types of invisible aligner, read our full article on aligner braces where you will discover a lot more information about prices and the practicalities of wearing them. If you’re considering treatment with Invisalign you can find out whether you’re a suitable candidate by filling out a simple two-minute Smile Assessment. Around 90% of orthodontic cases can be treated with Invisalign but it’s still worth checking if you’re one of them! All being well, you can go ahead and search for an Invisalign dentist near you to get started with your first consultation. If you discover you aren’t a suitable candidate for Invisalign, fixed clear braces are probably the next best option. How do traditional clear fixed braces work? 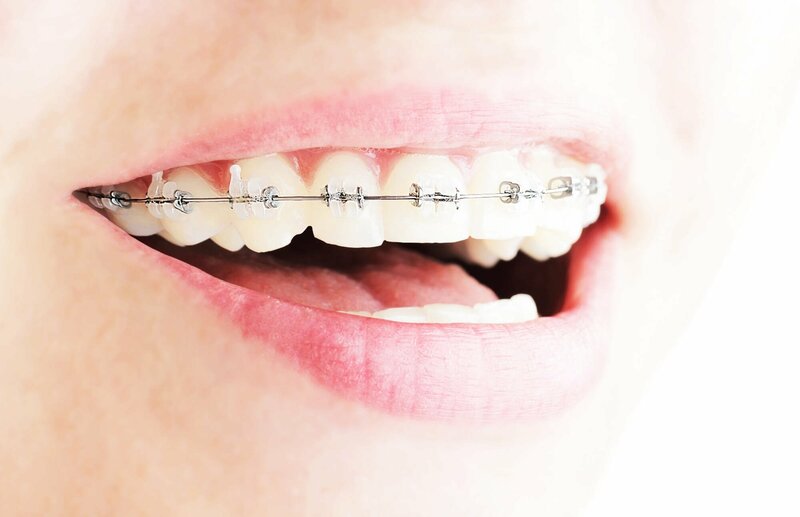 Just as with conventional metal braces, clear brace brackets are attached to each tooth and then connected with a wire. This system is effective at treating all kinds of tooth misalignment. Through careful placement of the brackets your orthodontist can manipulate your teeth in all directions to pull them into proper alignment. Treatment usually takes 18-24 months, although some brands offer faster treatment thanks to the technology they use. Traditional fixed brace systems require an orthodontist to tighten and adjust the wire regularly. Users often report sore teeth for a day or two after each tightening. On the other hand, newer self-ligating systems (like Damon Clear) use advanced technology wire which automatically adjusts gradually during the course of treatment. This results in a more comfortable experience for the wearer and reduces the number of checkups needed. Clear brace brackets are made from either a clear ceramic material or a plastic polycarbonate. Most systems use a metal wire to connect the clear brackets, but patients may have the choice of a white archwire. These are generally more expensive but have the benefit of making the braces far less obvious, especially from a distance. While wearing clear ceramic braces you will need to take extra care to keep your teeth clean, especially the places that are hard to reach with normal brushing. Although they can be a little uncomfortable at first, most wearers soon get used to their braces and don’t experience any ongoing discomfort. There is the possibility for mouth sores while the cheeks and gums adapt to the new fittings, but using orthodontic wax will help reduce abrasion. According to a 2018 report from the British Orthodontic Society, almost all orthodontists in the UK offer traditional metal braces, while upwards of 75% offer clear aesthetic brackets as an alternative. A similar number supply clear aligners, so whichever option you choose, it shouldn’t be too hard to find an orthodontist to treat you. All of these perks come at a cost, of course, but it’s a price that many patients are willing to pay for the convenience, discreetness and comfort offered by Damon Clear braces. UK-based company Clearsmile provide both a fixed brace and an aligner system for teeth straightening. Their fixed brace is self-ligating so offers the same benefits as the Damon Clear system. The archwire used in Clearsmile braces is coated white by default. The aligner treatment focuses on the front 10 teeth only, so isn’t suitable for patients whose back teeth need to be re-aligned. This type of treatment can take just 4-12 months to complete. Invisalign is the leading brand of clear teeth aligner around the world. The American company behind the braces, Align Technology, was the first to develop a clear teeth aligner brace back in 1999. Since then, they have brought out a range of aligner braces to suit different needs. These include Invisalign Lite (for minor dental corrections) and Invisalign Teen (designed especially for teenagers). Do you want to find out whether Invisalign braces could help you? You don’t need to visit a dentist – just take Invisalign’s free Smile Assessment online. It only takes a couple of minutes to fill in your details. If you’d rather speak to a dentist in person about your teeth, get started by checking where your nearest Invisalign provider is located. ClearCorrect is another brand of clear invisible brace available in both the US and UK. Designed and manufactured in Texas, they function in much the same way as Invisalign. It’s recommended that you wear the aligners for at least 22 hours a day for optimum results. Clearstep is another company that manufactures clear aligners for teeth straightening but they are mainly available in Europe and Asia. Again, these should be worn for at least 22 hours a day, if not longer. Clearstep also produce a teeth whitening gel which can be used in conjunction with their aligners to perform two jobs at once. Many orthodontists prefer to work with one or two particular brands, so you’re unlikely to find a dental clinic offering this full range of choices. There are many other brands available that we haven’t listed here. Remember that more established companies like Invisalign have had more time to refine the technology used in their products – newer companies won’t necessarily have the same level of experience. It’s a good idea to ask your dentist why they recommend a certain brand. They may have a preference based on costs, performance, service from the company, technology, and a number of other factors. If you’re not happy with the one they use, or think they are putting their own profits above your personal needs, you can always look around for an alternative. If you know you want Invisalign clear aligners, it’s easy to find your local Invisalign dentist using the button below. You can even book your first appointment online. The cost of clear fixed braces is typically higher than their all-metal counterparts because of the materials and technology used. To save money, some patients may opt for metal brackets on the lower teeth, which are less visible, and clear brackets on the upper teeth. Before we look at what invisible and clear braces cost, keep in mind that prices can vary greatly from one dentist to another. The price charged will also depend on your location and the length and complexity of your treatment. If your teeth just require mild correction, for instance, you may be able to use Invisalign Lite which is cheaper than Invisalign Full. You’ll need to pay for your orthodontic treatment privately since the NHS doesn’t provide clear braces for adults. NHS braces are only available to adults when considered medically necessary, and even if you do qualify for them you will be stuck with the traditional metal variety. So, if you are after clear ceramic braces or invisible aligners, private dental care is your only option. You can get an idea of the price of different brands in the table below. Fixed brace or removable aligner? Although this table gives an idea of clear brace prices, it’s definitely worth shopping around to get quotes from a few different dental clinics. Ask your dentist if they offer an interest-free payment plan to help you spread the cost of your treatment. If you opt for clear fixed braces you’ll need to take some extra precautions while you’re wearing them. Your orthodontist will show you how to clean your braces and teeth properly. This will take some extra time each day as braces contain so many nooks and crannies where food can get stuck, leading to a build-up of bacteria. If possible, you should clean your teeth and braces straight after eating. If this isn’t possible, at least rinse very well with water. To floss below the archwire it will help to use a floss threader or interdental cleaner. Habits like nail biting or pencil chewing can also cause damage to the wires or fittings. Since the ceramic material used in clear brackets is more brittle than metal, it’s crucial that you follow your dentist’s instructions. Did you know that it’s just as important to look after your teeth carefully after your braces come off? Most patients will want to have a thorough dental cleaning to remove any plaque or stains that have built up while they were wearing their braces. As with any tooth straightening treatment, you’ll probably have to wear a retainer every night (and perhaps during the day at first) for as long as you want your teeth to remain in their new position. Even after years of being held in place by braces and a retainer, left to their own devices they can soon revert to their previous wonky state. There are two types of retainer: removable and fixed. Fixed (or ‘bonded’) retainers consist of a thin wire inconspicuously attached behind the front 4-8 teeth to stop them moving out of position. These need to be cleaned with the same attention as fixed braces. Removable retainers are much easier to clean and allow the wearer to eat and brush their teeth as normal. However, there is the potential for them to be lost or damaged. This can get expensive over the years, since dentists charge anywhere between £100 and £300 for wire retainers (such as Hawley retainers) and £70 to £150 for clear retainers (such as Essix retainers). Both types of removable retainer will need to be replaced at some point anyway. If you look after them well they can last for five years or more. Your dentist will be able to advise you whether a fixed, wire, or clear retainer would be most appropriate for preserving the new position of your teeth. The table below summarises the information given in this article so you can more easily decide between clear and invisible braces. On balance, adults and teens looking for a way to straighten their teeth without it being noticeable will probably find Invisalign the most suitable, efficient and convenient option. Not only are the clear aligners very hard to spot; they are also removable and usually cost less or the same as fixed ceramic braces. To find out if you’re a suitable candidate for Invisalign treatment, don’t forget to take your free online Smile Assessment. It takes less than two minutes to get an answer! Our goal at Dentaly.org is to give you all the information you need to make the right decisions when it comes to your oral healthcare. We hope you found this article helpful!